It comes as a surprise to many that Catholics do street evangelization, yet street evangelization is as old as the Church and has a long history – from the prophets of old to recent groups like Frank Sheed’s Catholic Evidence Guild. There is a common misunderstanding that street evangelization is the same as “Bible thumping” or “proselytizing”. 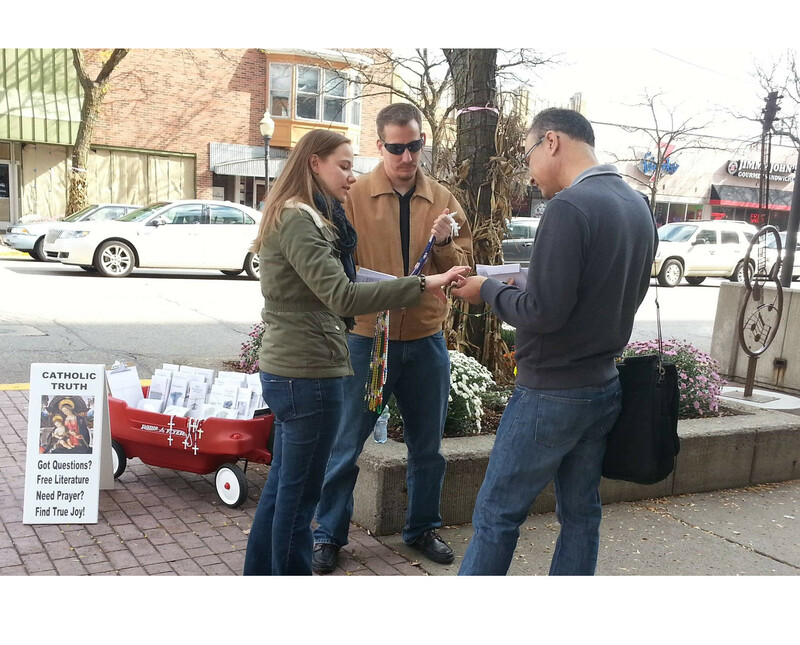 Street evangelization is not about screaming at people, proselytizing, or telling anyone that they are going to hell. Rather, it is about offering a listening ear, sharing in a conversation about Jesus Christ, and praying (for any reason) with those that want it. By taking our Catholic faith to the streets we aim to make the message of Jesus Christ accessible to everyone by being available to anyone. “And he called the twelve together and gave them power and authority over all demons and to cure diseases, and he sent them out to preach the kingdom of God and to heal. And he said to them, “Take nothing for your journey, no staff, nor bag, nor bread, nor money; and do not have two tunics. And whatever house you enter, stay there, and from there depart. And wherever they do not receive you, when you leave that town shake off the dust from your feet as a testimony against them.” And they departed and went through the villages, preaching the gospel and healing everywhere.” (Luke 9:1-6, RSV) Street Evangelization is but one of many necessary and effective methods of evangelization. It creates a bridge of trust and helps connect people to the Church and all of her institutions. St. Paul Street Evangelization offers resources to take evangelization into the street whether literally, or through our relationships in everyday life. 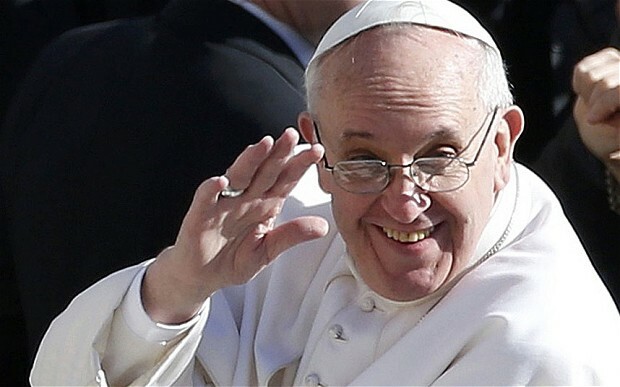 What makes the New Evangelization new is not that it takes place at a particular moment in time, rather that there is a special emphasis on the work of the laity in union with the Catholic Church as the principle agents of the New Evangelization. Most of the people involved in St. Paul Street Evangelization are normal Catholics either in school or with families, jobs, and mortgages just like you. By being involved in St. Paul Street Evangelization we are learning to share the joy and peace that being a follower of Jesus has brought to our life – all in a non-confrontational way that others respond positively to. The key to all of this is that we are actively sharing the message of Jesus Christ. Street evangelization is probably outside the comfort zone of many of us, but we can’t let that stop us. It is outside of our comfort zone where we grow. Throughout scripture Jesus speaks and teaches in public places to those who will listen. The lessons and the results vary, but one thing is clear, in his public ministry he took the proclamation of the Kingdom of God to the road. After the Resurrection, Jesus walked on the road to Emmaus with two disciples who at first did not recognize him. Jesus opened up the scriptures to them and set their hearts on fire (Luke [24:13]-35). Even today Pope Francis is calling us to be agents of the New Evangelization and take our Catholic faith to the streets. While we communicate more often at our computers, there are still plenty of places in towns and communities where people gather and travel outdoors. Catholic street evangelization might not look like what you expect. For an explanation of what our teams do when they evangelize, go here. St. Paul & The Apostles. At one point during Paul’s missionary journeys he shared the faith with a group of Stoic philosophers who brought him to the open hill of Ares (Areopagus) where a council of elders would meet to discuss education, philosophy and religion. (Acts [17:16]-34) There he challenged their worldview, proclaimed the message of Jesus Christ, and invited them to the Christian faith. Some said no, others said they would hear from him again, and yet others started following him. Paul and the apostles preached the Good News to those that would listen and by nature of our baptisms all Catholic Christians are called as well to be evangelizers. St. Francis. Founder of the Franciscan order was well known to have received permission from the pope to preach repentance everywhere. Often times churches were not large enough to hold the crowds, so they would proclaim the Gospel outside. He is probably one of the most well-known Catholic street preachers apart from Paul and the Apostles and a great example for Catholics. Street evangelization is about proclaiming Christ, and Christ crucified (1 Cor 2:2). St. Philip Neri. St. Philip would go through the streets & marketplaces of Rome and talk to young people about the faith. St. John Bosco. St. John Bosco would not so much preach openly in the street, but he would go there to break up fights, invite orphan boys to his oratory, and evangelize them. He would use his skills as a juggler to attract their attention and then invite them to Mass. Public evangelization does not happen only when Catholics are part of a group like SPSE. There are many examples of parishes and Catholic groups setting up booths at festivals, parades, and other public events and handing out literature on the Catholic faith. There are more examples than we can count of individual Catholics and clergy making themselves available to the public. St. Paul Street Evangelization is one example of an organized effort to do what many Catholics have been doing for a long time. Join us on Facebook and read about the incredible stories that evangelists are sharing with us.